After you’ve tried these smashed potatoes it’s pretty hard to justify making potatoes any other way. The skins go beautifully crisp while the insides are gorgeously fluffy- they’re completely irresistible drowned in the fresh pesto. This is my favourite pesto lately, it’s the perfect balance of classic and zingy, try doubling this recipe and keeping the extra in a jar for later. Preheat oven to 200’C. Get a large pot of water boiling. Grease a roasting tray with olive oil and set it aside. When the water is boiled, add the potatoes and cook them until tender, about 15-20 minutes. Then drain them. Place the potatoes onto the roasting tray. Use a potato masher or fork to carefully smash the potatoes until they’re flattened but still in one piece. Mash the garlic cloves, still in their skin, and add them to the tray. Drizzle over the olive oil and a good pinch of sea salt and pepper. Pop the tray in the oven and roast for about 20 minutes, or until golden and crisp. 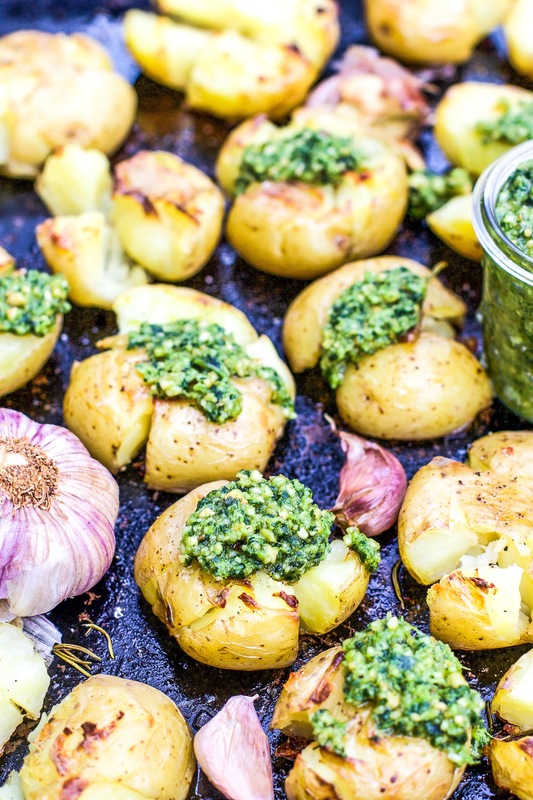 While the potatoes are in the oven, make the pesto. Add the cashews to the oven and roast for about 4 minutes until lightly golden. Add all of the other pesto ingredients to your food processor with the roasted cashews and blend on high until thick and smooth. 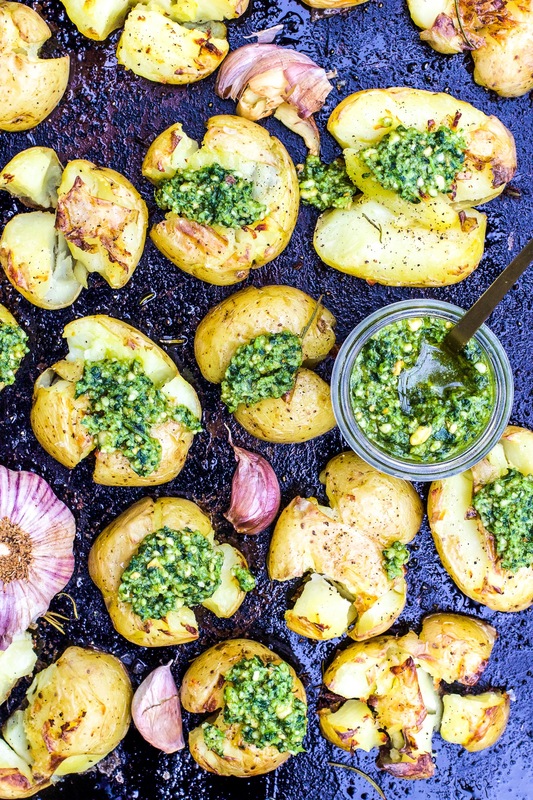 Serve the crispy potatoes hot with the pesto dolloped over them. Just made the pesto which was amazing! Served it over baked white fish that was baked on a bed of caramelized onions and served with sauteed Green Beans, Mushrooms and Garlic. I can’t wait to try the pesto on – well, everything really. Next up, the smashed potatoes. Thanks so much!